There are a range of benefits to be gained by adhering to the FDA 21 CFR Part 11 compliance requirements. In addition to meeting essential regulatory requirements, it allows an organization to take advantage of the latest technology, facilitates the elimination of paper, permits changes to be effected to processes more easily & efficiently. We can automate some of the most mundane & repetitive tasks in our day to day jobs. Compliance permits faster access to the “intellectual capital” of a business. What is an electronic / biometric signature? • It is a compilation of symbols adopted by an individual to be the legally binding equivalent of the individual’s handwritten signature. Affixing an electronic signature to electronic data is equivalent to an individual’s traditional handwritten signature or initials. Example of a non-biometric electronic signature, is a user identification code and password. • When considering a biometric signature we are considering a proof of identity which is unique to the individual and is measurable. Examples of biometric signatures are finger prints, retina scans and voice prints. Q: Many companies today have the user ID entered as the person’s full name. Is this an appropriate ID, since it could be guessed relatively easily? Q: Will users need to have a user ID that is not easily guessed? Q: Is a non-biometric E-signature security process acceptable if the user name is automatically displayed, prompting the need for a unique password to complete the security check? Understand Product and Process Validation. Inform yourself about Product and Process Validation. 590 pages of information, provided in a visual, easy to understand format. Q: What about having individual certification for different divisions within an organization? Should firms delay sending the certifications until all of their personnel have been trained in Part 11? – Unique to an individual. – Associated to their meaning (e.g. review, approval, authorship). – Appearing in full on printed copies of electronic records. Any information (text, graphics, data, audio, pictorial) created, modified, maintained, archived, retrieved, distributed, or reported in electronic form within a computer system. • Closed System means an environment in which system access is controlled by persons who are responsible for the content of electronic records that are on the system. There is a requirement for compliant audit trails. What is necessary for trail compliance? • Who did what, wrote what, and when (date/time). • Can not be paper-based. • Can be part of the e-record or a record by itself. • Use of time-stamped audit trails, 21 CFR 11.10(e), must be computer-generated and saved in chronological order. • An audit trail shall not be modified by the person whose action creates it. 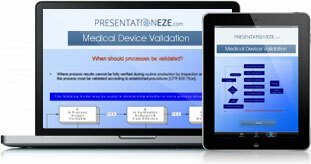 Medical Device Validation, Regulation, Classification, Risk Evaluation, …. Use to develop your personal understanding. View, when and where suits, from the convenience of your desktop, laptop, tablet, mobile. Q: Can an audit trail be paper? Q: Can a firm that creates batch production records in electronic form archive them as paper only? Q: Does Title 21 Part 11 apply to the following situation: In our HPLC usage we use computer software to analyze data. We take the printout as a permanent record. We do not save the file, but all the data including peaks and calculations are available in the form of a printout for the investigator to see. Is this acceptable? (We consider the computer as transient storage). Q: If analytical instruments are computerized, such as the Hitachi Chemistry Autoanalyzer, will the E-signature rule apply when GLP data are created and maintained electronically? Q: Explain further “the retention of computer systems for reading electronic records”? • Hybrid Systems are semi-automated systems that contain both electronic and paper-based records. • At present many batch records and laboratory chromatography systems are hybrids. Compliance Policy Guide• Represent the agency’s current thinking on how to comply with the regulations for electronic records and electronic signatures. • Regulatory actions will be based on a case-by-case evaluation. As explained in the preamble to the final rule, Part 11 does not grandfather legacy systems and FDA expects that firms using legacy systems will have taken steps to achieve full compliance. 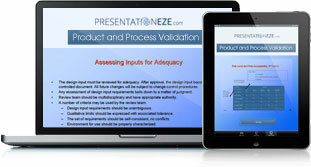 Product & Process Validation – Information and training presentation.